With restaurants such as Bar Shu, Empress of Sichuan and Chilli Cool ramping up a strong following amongst London bloggers, it seems like Sichuan food is well aligned to be the next ‘big’ cuisine. Having lived in the south-west of China for a good period, I like to think I am fairly familiar with the flavour profile. Whilst the addition of hua jiao Sichuan pepper corns is abundant in the cooking, there is a common misconception that all Sichuan food is hot and numbing (ma la). In fact some of my favourite Sichuan dishes such as Zhang ya zi (zhang tea smoked duck) and huo guo rou (double cooked pork) are pretty much mouth-numb free. One night, after a big whine about how substandard non-southern Chinese food is in London, a mainland Chinese friend had recommended I take a trip to Earls Court to try No. 10 Sichuan. It’s where he gets his ‘fix’ apparently. Determined to seek out good Sichuan food we visited on a cold Sunday evening, arriving early to find the restaurant nearly at capacity. The restaurant is fairly small, fitting no more than 25 in a very tight, dark space. The menu is divided into two sections – the short one page Sichuan menu and the long ‘other’ menu. Looking around us, the mainly chinese student crowd were intently chowing down Sichuan classics, so it was clear that we should stick to this side of the menu. We started off with the Shui zhu niu rou (Water cooked beef). The huge pot of steaming spicy broth, dried chilli’s, mouth numbing pepper corns, tender slices of beef and vegetables was topped with delicious red chilli oil. There was serious heat in this dish (we did tell the waitress to make it ma la) and boy did we need a bowl of rice to wash it down. The depth of the broth was rather addictive and the corn flour tendered beef was so silky, yet fiery hot at the same time. Sam found the dish a bit too hot, but at the same time, he couldn’t get enough of it – which of course meant he was happily in tears munching through this dish. 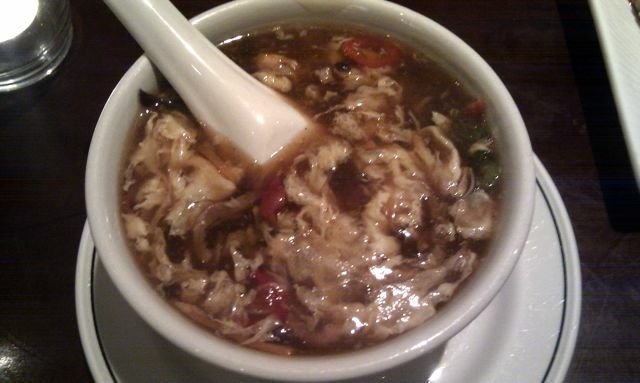 Next came a perfectly sour and sweet and spicy suan la tang (hot and spicy soup). 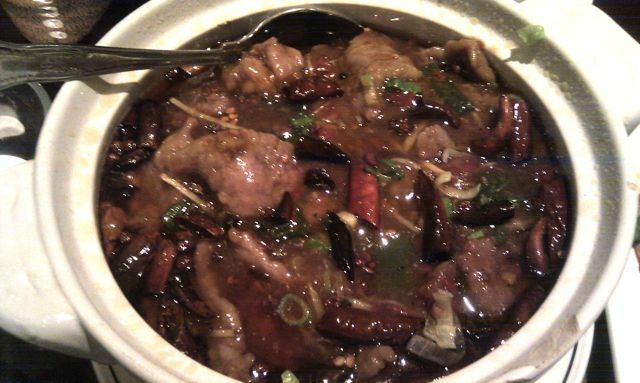 The serving was fairly generous, thick and made spicy with a generous shaking of white pepper. We probably should have ordered two bowls as we found ourselves fighting over the last few drops of this. To say our last dish was a disappointment would be an understatement. After high expectations were absolutely exceeded with the first two dishes, we were bitterly disappointed when our la zi ji (chicken cooked with dried chilli’s) was served. Expecting a huge bouquet of vibrant red dried chilli’s surrounding pieces of lightly fried boned chicken, what we got instead, looked nothing of that sort. So far from our expectations in fact that we actually called the waitress over just to check that it was the correct dish. Stir fried pieces of boneless chicken were served wok tossed with dried chills, onions and vegetables. 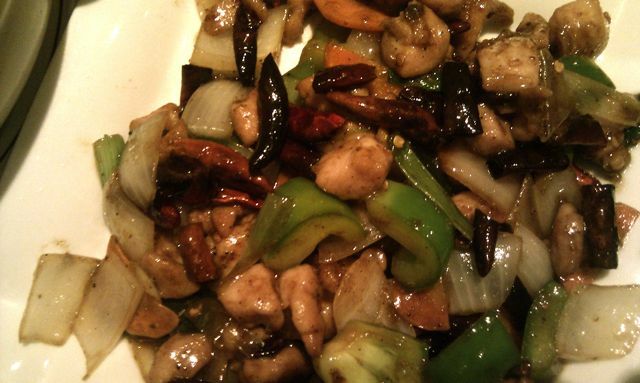 To me the dish looked like it could be an acceptable version of gong bao ji ding (kung pao chicken). In fact it tasted more similar to a gong bao ji ding than a la zi ji. But alas according to the waitress, it was indeed their la zi ji. Overall No.10 seems to produce some solid Sichuan dishes. Neighbouring tables were happy munching down dan dan mien (spicy pork tossed noodles), liang mian (cold noodles in chilli oil) and other Sichuan comfort food which I will definitely be back to try. Portions are large, prices reasonable and service rather friendly for a Chinese joint, but stick to the Sichuan menu – it’s fiery hot, but absolutely worth numbing your mouth for. Around £40 for two including non-alcoholic beverages and service. This entry was posted in By Area: West, London Restaurants and tagged Chinese, Chinese cuisine, Cooking, earls court, food, london, restaurant, Sichuan, Szechuan cuisine. Bookmark the permalink. @Kay: I completely agree, I find myself going to different chinese resturants for specific dishes only..
Shame about the La Zi Ji! Seems to be a trend where some dishes are done well while others are not in Chinese restaurants. I always go to certain places but after many trial and errors, you know which are the ones to order and which not to. No. 10 Sichuan seems a good place…will definitely try when I find myself in Earls Court.